There is a $150.00 fee to get your puppy on the airplane and $250.00 for an adult (large crate). This includes a health certificate, rabies when necessary, a shipping crate, and travel time to the airport (2 hours each way). The cost of shipping is the buyers responsibility. Usually the fee is between $200.00 and $300.00 for puppies, adults are higher, depending on crate size. The cost of airfare is usually prepaid. In the event of a return, shipping expenses are not refunded and are the responsibility of the buyer. Prices are $900.00 and up for Bi's and tris. No longer will puppy's be priced for their genetic potential and overall quality as there are far more buyers wanting merle color and the merles are far more in demand for companions. ​​ We only have standard colors here. Bi's and tris are the best buy as far as money, that's for sure but a great dog can come in any of the 4 basic colors. Occasionally we have adults available for sale and they are priced on individual basis. 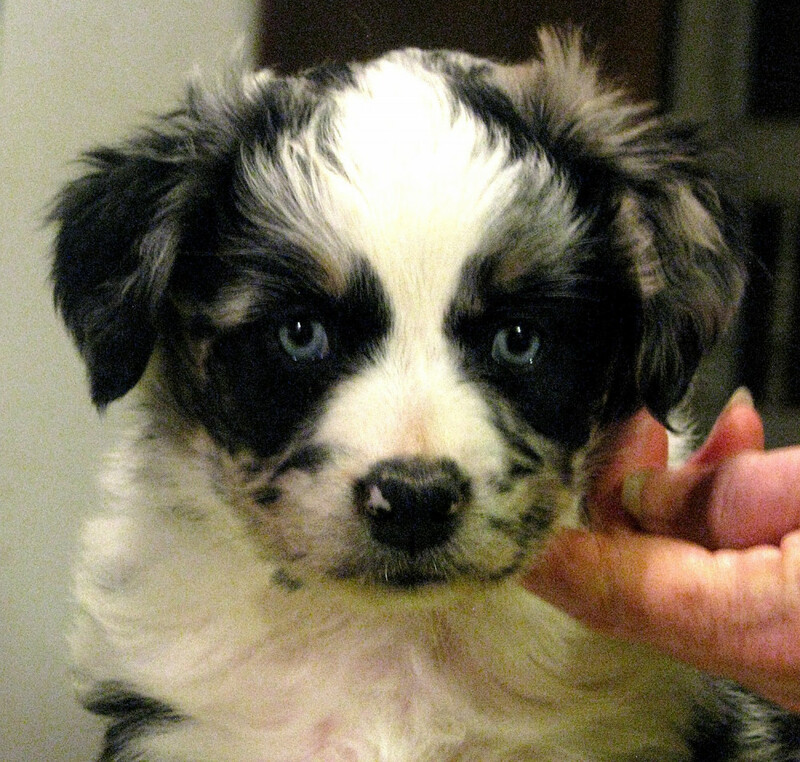 All Fairoaks dogs are registered with ASCA (Australian Shepherd Club of America) and the AKC (American Kennel Club). You can reserve puppies from unborn or unweaned litters with a deposit of $300.00 on a first-come, first-serve basis and suitability of each puppy. Deposits are non-refundable. For over 55 yrs I have rigidly selected for breed type and the mentality of the old style Aussies. 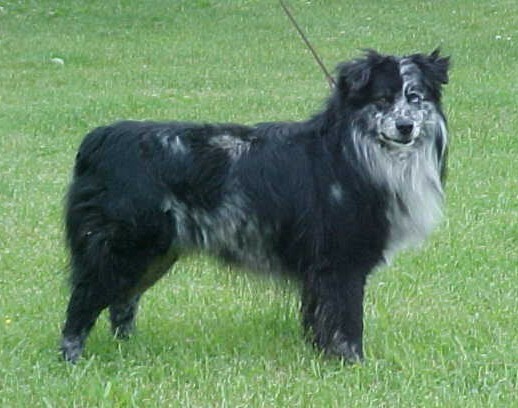 Breed type includes the traits that make an Aussie look like an Aussie, and the mental traits of the foundation dogs which had been selected for decades. 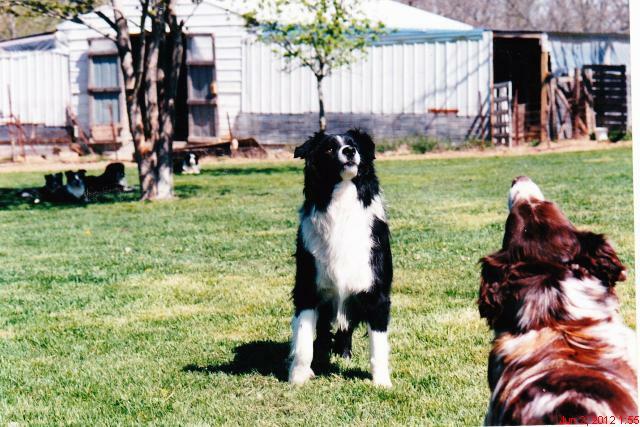 Mentality and breed function are what first brought the Aussie type to popularity with early ranchers, herders and farmers. Moderation and athleticism, enabled them to carry out the jobs that needed doing, whether it was driving cattle, fetching sheep, killing varmints, protecting the family and homestead or warming a bed on a cold night; being a true companion. the Aussie is not only highly intelligent and trainable but in creditably intuitive. It is a quality I have seen since the 1960s and one that I cherish. Fairoaks line, have behind them over 50 years (as of 2016) of experience, selection and knowledge in a direct line of decent which stresses maintaining the qualities which came from the early roots of the breed. They are not for everyone. 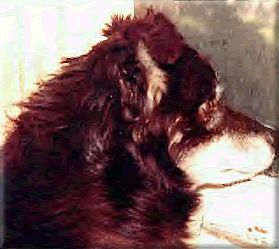 Of course all Aussies go to the roots of the breed, but the majority have changed over the generations due to selection and over-emphasis on superficial qualities. Fairoaks have been chosen generation after generation with only my ideal in mind. Fairoaks is one of the few bloodlines that is recognized as such by the knowledgeable Fanciers in the Breed. What sets the old-fashioned Aussie apart was his unique and wonderful mind. 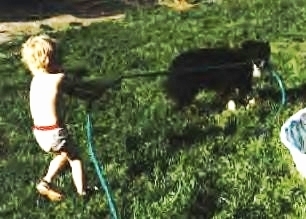 livestock working ability, physical and mental soundness, and protective, guarding instincts; characteristics that I have concentrated equally upon, since 1966. Fairoaks Isis UD (AKC) ASCA CDX, RACH winning her Rally Excellent in one trail weekend, first try and 9 yrs old. ! 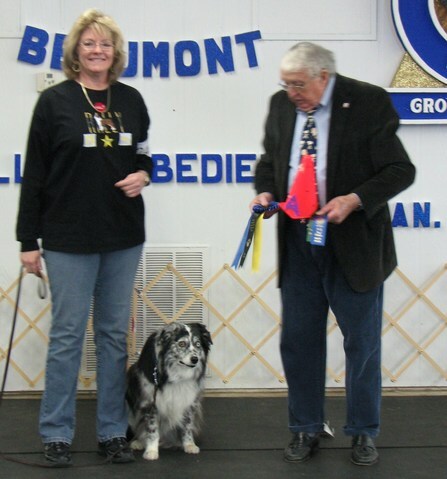 Owned and trained by Julie Arisco, Beaumont, Texas. Because of the proven versatility of this bloodline, and the stated explanations, a pick of the litter is often not really possible, a fact I am very proud of. Fairoaks dogs are in homes, on farms and ranches and in breeding programs all across the country. 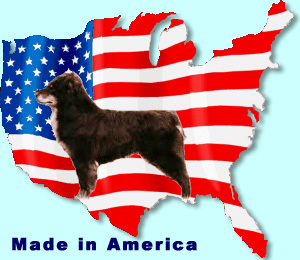 We have dogs in all mainland states and Canada. In Europe, Germany, Holland, Norway, Finland, Belgium, Sweden, Australia, New South Wales and England, where they have spread out and contributed to breeding programs throughout the world. Working Aussies are active, but should not be hyper. 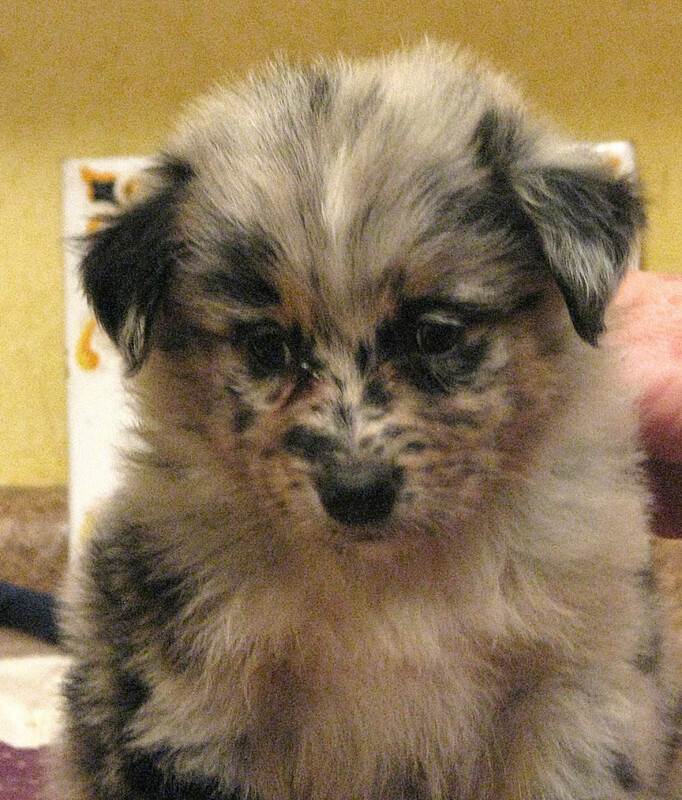 A Fairoaks puppy, needs obedience training and general guidance as he grows. 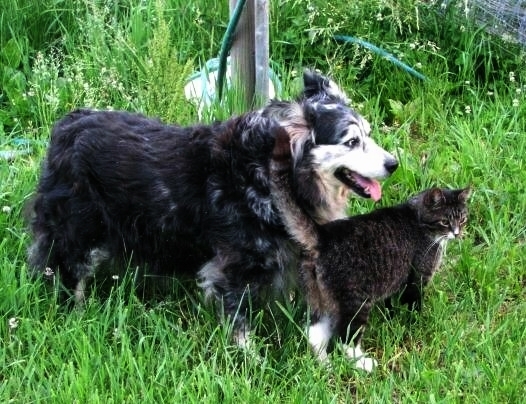 You can not simply let the puppy run wild and hope to end up with a superior companion. Fairoaks dogs are highly intelligent and will set their own boundaries, which you may or may not agree with. Molding the pup is not difficult or even particularly time-consuming, but if you do not want to do this then our dogs are not for you. Many people think that because they are working dogs that they must have thousands of acres to run, but this is not the case at all. We have many puppies/dogs in cities and apartments. As long as you give the dog a physical outlet they are content to be with you no matter where. Above is Ethan, my son, at 4 yrs old & My wonderful Josie & her pal Hoover. Littermates, Jagular & Askya.